Howdy Friends! This is an exciting day. 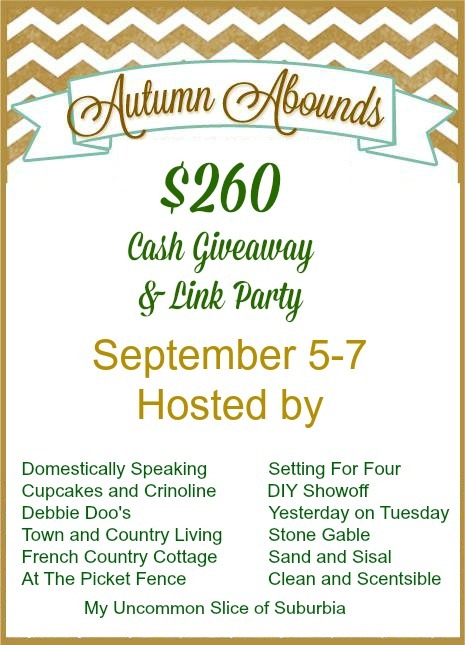 Twelve of my favorite bloggers and I are hosting a CASH Giveaway of $270. How many ways could you use that extra cash this time of year? AND… we’re also hosting a link party! « Pinterest Party: Home. Made. Interest. I’m going on a cruise in October so I would use it for fun money and birthday gifts for my little mans 6th birthday! I would treat my husband to something! I would use the money for Christmas presents for my handicapped daughter. She loves Barbies and Cabbage Patch dolls, so I would buy her the clothes for each of her dolls. Helps with fine motor control. I would save the money and put it in my bank account!